I was having a pretty good week until Tuesday night, when my throat became increasingly sore and I started feeling pretty crummy. I woke up in the early hours of Wednesday morning feeling like death warmed over, turned off my alarm clock, and gave up on work that day. I was feeling even worse Thursday; another day of sick leave expended. I felt slightly better Friday, which was my 9/80 Friday off. Then Cindy reminded me that Nathan had another smash tournament in Albuquerque in the morning, and she couldn’t possibly take him, and what was I going to do? I was going to sleep in again, is what I was going to do. I woke up at 8:30 feeling significantly better. However, I was still tired and I still didn’t have my appetite back (I always lose my appetite when I’m sick, even if it’s not a stomach bug and I’m not actually nauseous.) Found Nathan in the shower, getting ready for his smash tournament, to which he apparently really was expecting me to take him. I felt enough better to give it a shot. Cindy put together a light breakfast for me while I got myself ready, in a rush, because it was already nearly 9:00 and the tournament nominally started at 11:00, and it’s a long drive to Albuquerque. I grabbed my essentials (backpack, camera, cell phone). filled my pill bottle, and Nathan and I headed out. Traffic was light and we made good progress, even with my new respect for speed limits. We arrived almost precisely at 11:00 to find that the venue was still in the process of being unlocked and set up. I made sure Nathan was fitted out with enough quatloos for the day and took my leave. 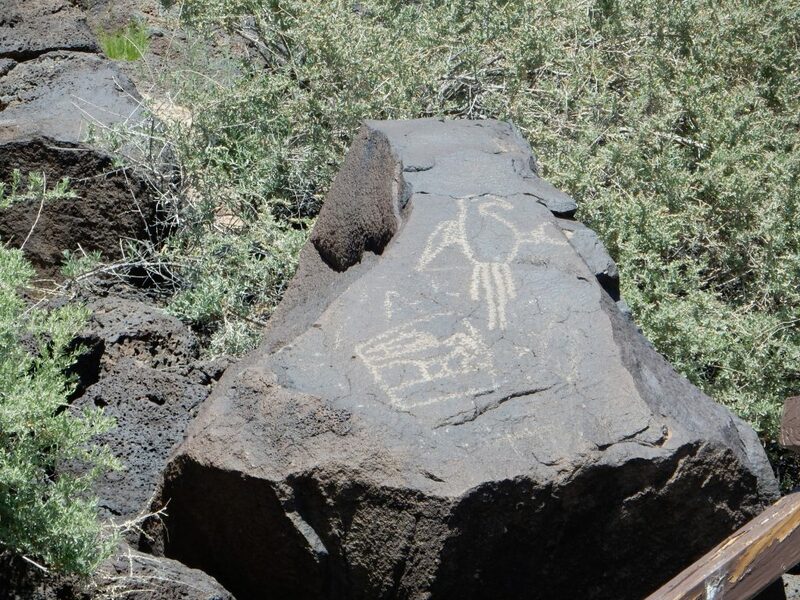 His venue was not too far from Petroglyphs National Monument. 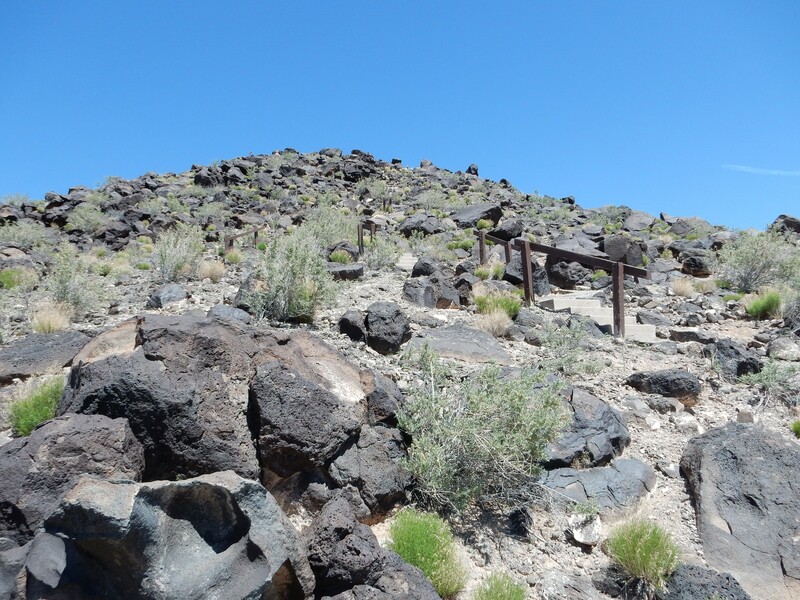 I decided the hike around the Albuquerque volcanoes would be fairly easy and might not wear me out too badly. (Had I been feeling fit, I would doubtless have had a go at the orbicular granite above La Luz Trail.) I’ve been to the Albuquerque Volcanoes before, but this was not a day to be ambitious. 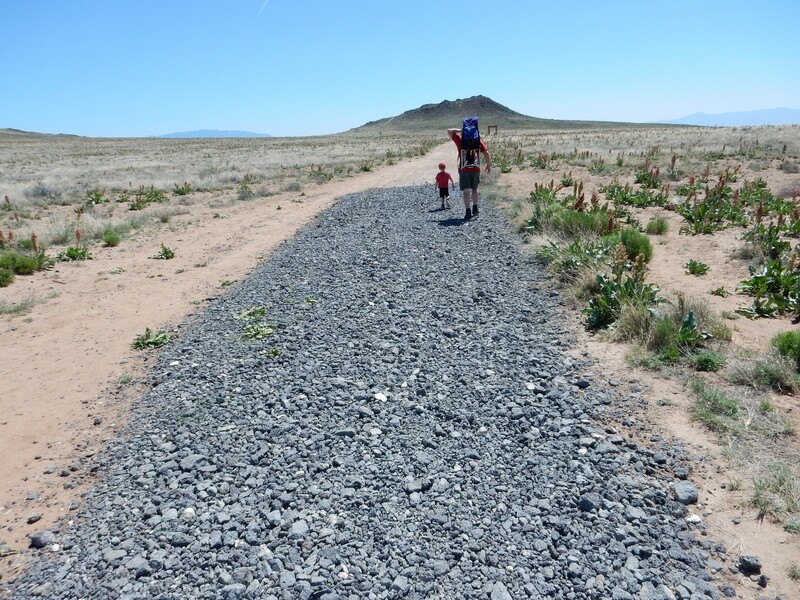 The volcanoes are located on the west side of Albuquerque, where there is a nice trail head. At left is Vulcan Volcano. Black Volcano is at center, and JA Volcano is at right. 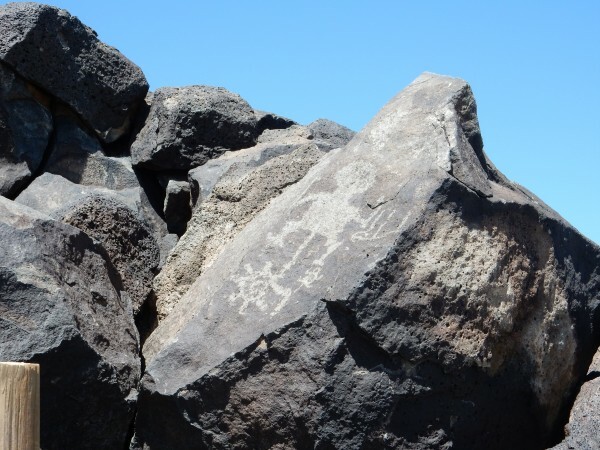 All are around 150,000 years old and are aligned, presumably along a fissure, with each other and with two more cinder cones further north. 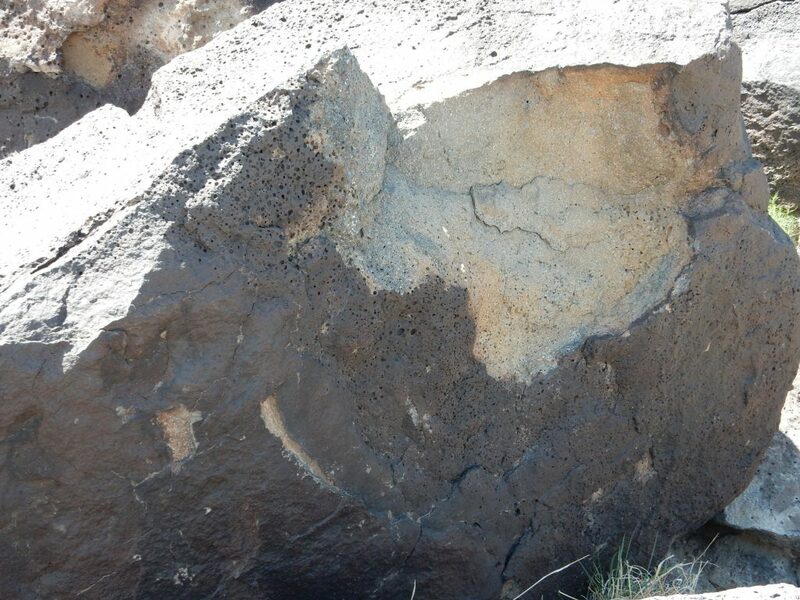 No trace of the fissure is now visible, so it was completely drowned by lava from the cinder cones, and there has been no further displacement on the associated fault. There has been some work on the trail network since my last visit. I’m not actually sure I like this. The coarse gravel is harder on the feet than plain dirt, and it is bound to make the trail hotter (though it was not a terribly hot day today). But those decisions are made at a higher pay grade than mine. The area was covered with wild rhubarb in full blossom. Y’all had the chance a couple of posts ago to laugh at my near-total ignorance of ornithology. I actually know something about botany, having been an avid gardener before moving to Los Alamos, and I can identify members of the more prominent families, such as the legume, composite, and, in this case, buckwheat families. (Though Bruce Rabe is probably recalling, with a chuckle, how I mistook a dicot for a monocot at Yellowstone a few years back.) I was impressed by how many wild rhubarbs there were in this area. Many of the trails crossing the area have been closed off with fences and warning signs, and restoration work has been done to return vegetation to the closed trails. 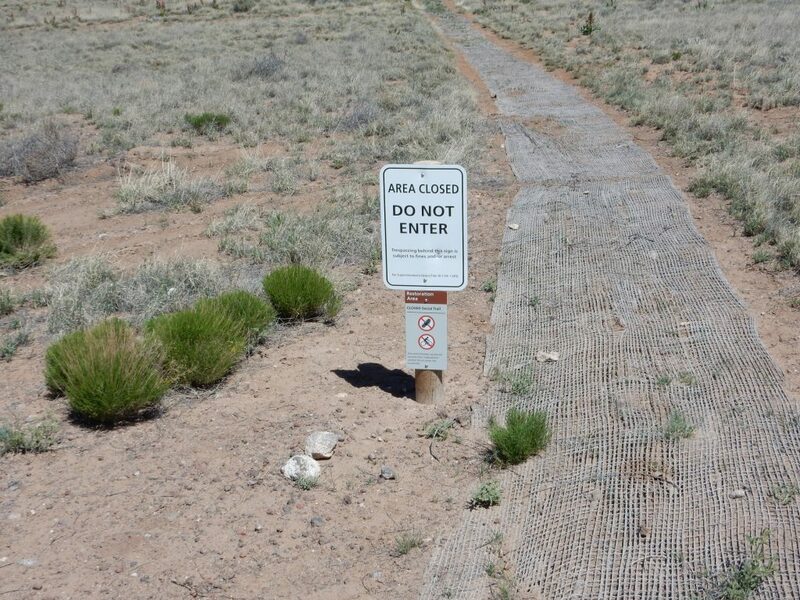 The netting doubtless is meant to protect the closed trail and allow it to revegetate. The lower sign (click to enlarge) identifies this as a social trail. Apparently this is the term for the trails people create spontaneously when they find convenient shortcuts. Urban planners sometimes accommodate social trailblazing by going back and paving social trails, but the Park Service seems to hate the things. Different milieus. Some bluffs to the northwest caught my eye. I cranked up the telephoto. 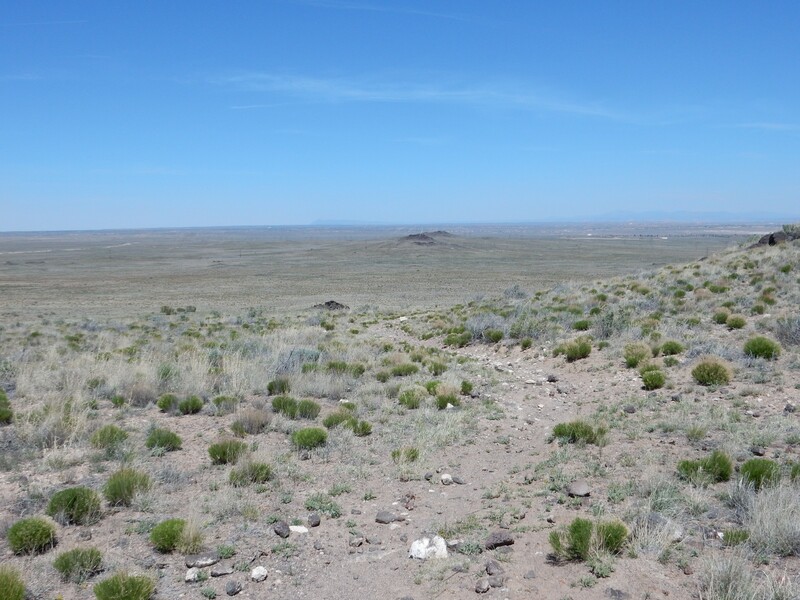 It’s hard to be sure at this distance, but if I’m reading the geologic map right, the light tan hills are gravel beds of the Santa Fe Group exposed on the foot wall of the Calabacillas Fault, one of the western rift-bounding faults of the Albuquerque Basin of the Rio Grande Rift. The geologic map shows that the east side of the fault is the downthrown side, meaning, the side that has dropped relative to the other side of the fault. 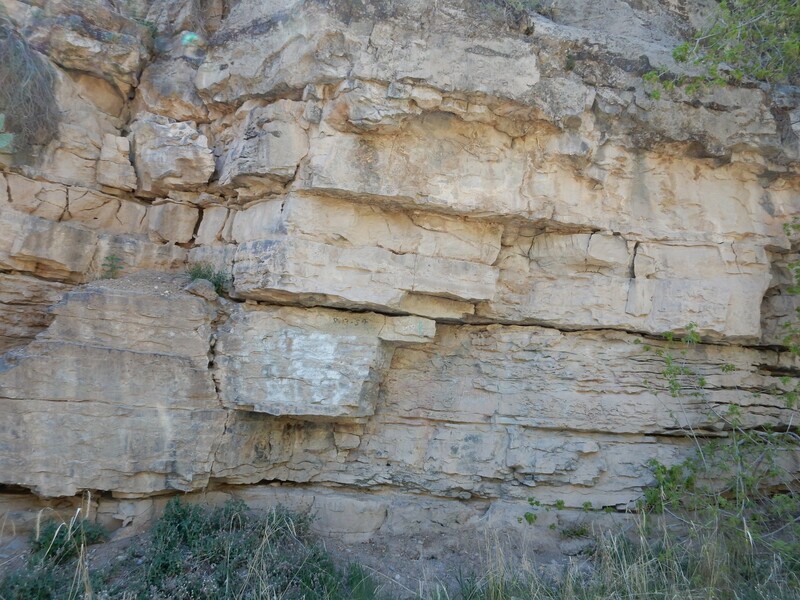 In a normal fault, the downthrown side is the hanging wall. A fault in which the footwall is the downthrown side, which is much less common, is called a reverse fault. 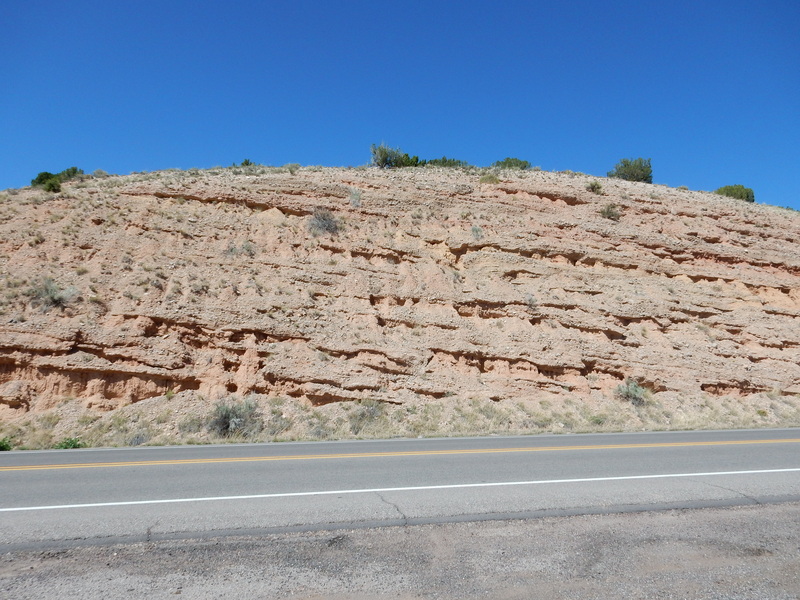 Reverse faults are not typical of the Rio Grande Rift boundary faults. So, basically, there is a fault running along the east face of these hills, dipping steeply into the earth towards the east, and the ground on the near side of has been displaced downwards to leave the far side higher up to form the hills. Beyond these hills is the valley of the Rio Puerco, which is the approximate western limit of the Albuquerque Basin. The main trail is marked with sun shelters. You can see some of the social trails that have now been blocked. Look, I understand that the Park Service is expected to maintain the area in as natural a state as possible. That has to be balanced against the desire of visitors to explore, which is a very human thing. The mountain on the skyline at center, beyond JA Volcano, is Isleta Volcano. Most is on tribal land, but part is crossed by the interstate highway, and I mean to visit sometime. This is dominated by Sandia Crest, the east edge of the Rio Grande Rift, towering over the Rio Grande valley and the city of Albuquerque. The view to the north, featuring Vulcan Volcano. Beyond to the left is the Sierra Nacimiento, the ancient range on the west side of the Jemez Mountains. I headed towards Vulcan, and found that the trail passes what looks like a borrow pit. A borrow pit is a kind of small quarry for sand and gravel used for road construction and other civil engineering work. The pit was fenced off, so I couldn’t get a close look, but the beds on the far side look like cinder beds, easily mined for aggregate. There is also an old dirt road headed off to the east. The trail continues up into a kind of crater on the north side of Vulcan. Rock beds are exposed on the north side of this crater. This is not actually the summit crater of Vulcan, but is more likely an explosion crater, perhaps from phreatomagmatic activity — hot magma coming into contact with ground water and causing a steam explosion. The floor of this crater is dirt and broken rock. The actual summit crater, visible on satellite, is filled with a frozen lava lake. This is now off-limits but its north edge is visible along the south rim of the explosion crater. 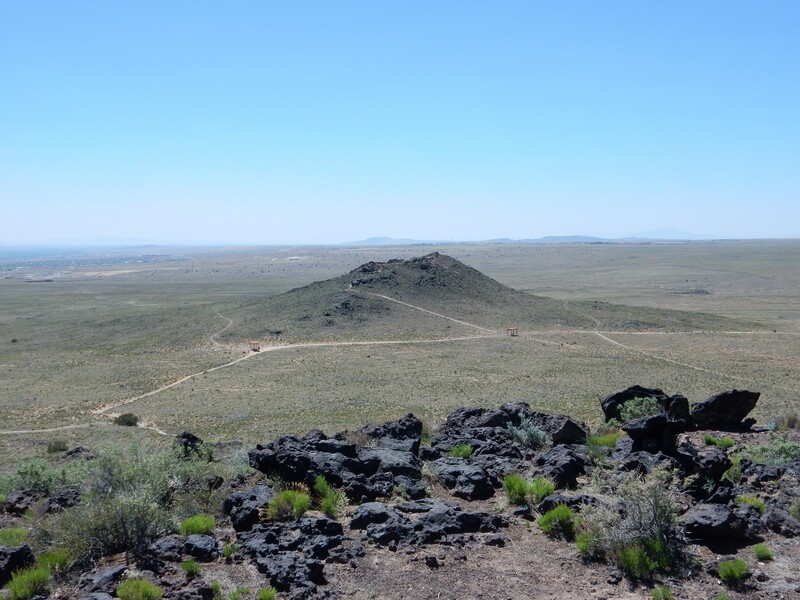 North of Vulcan are two more small cinder cones, not accessible by trail. From there I headed back. Not far down the trail I saw a couple of young men moseying down one of the closed trails. 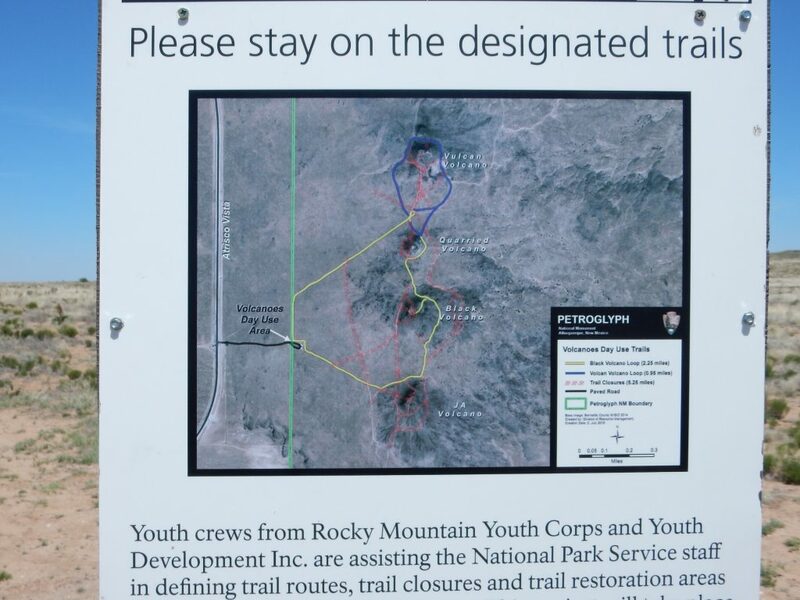 I checked my indignation: They had the look of college kids working with Rocky Mountain Youth Corps to rehabilitate the trails. A lot of the trails in the area have been shut down. Everything in red in this map. 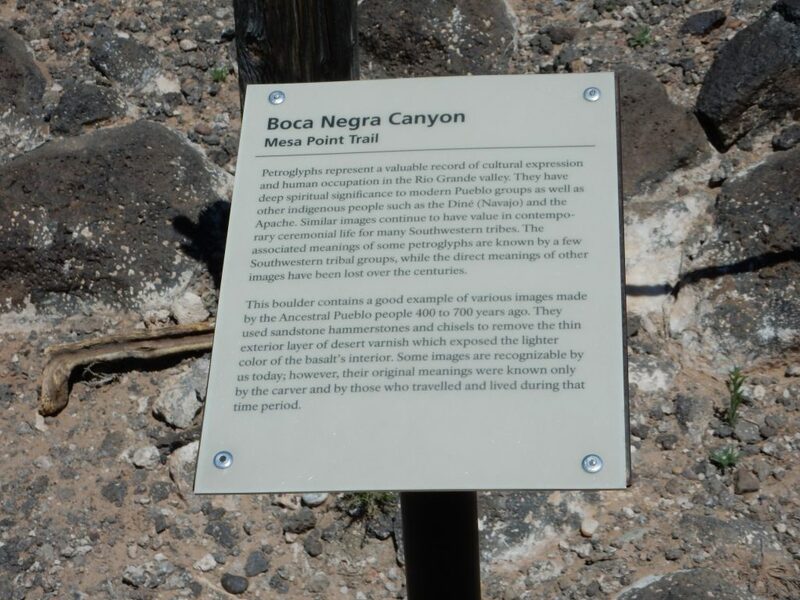 I packed up, found myself thirsty, and headed to the Boca Negra section of the monument, which reputedly had a water fountain. The cover over the fountain had already been ripped off when I got here, doubtless by an earlier thirsty hiker. Well then. 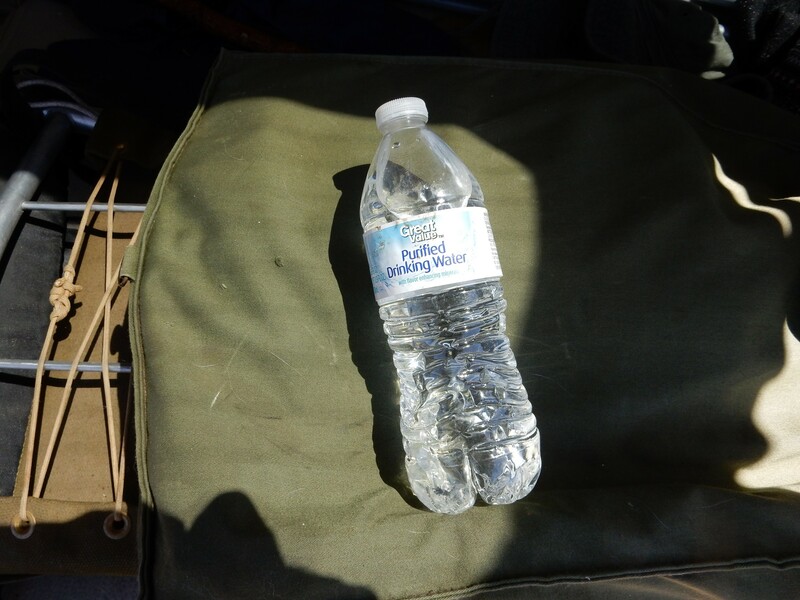 Perhaps I had some water in my backpack; otherwise, I would have to call it a day for hiking. 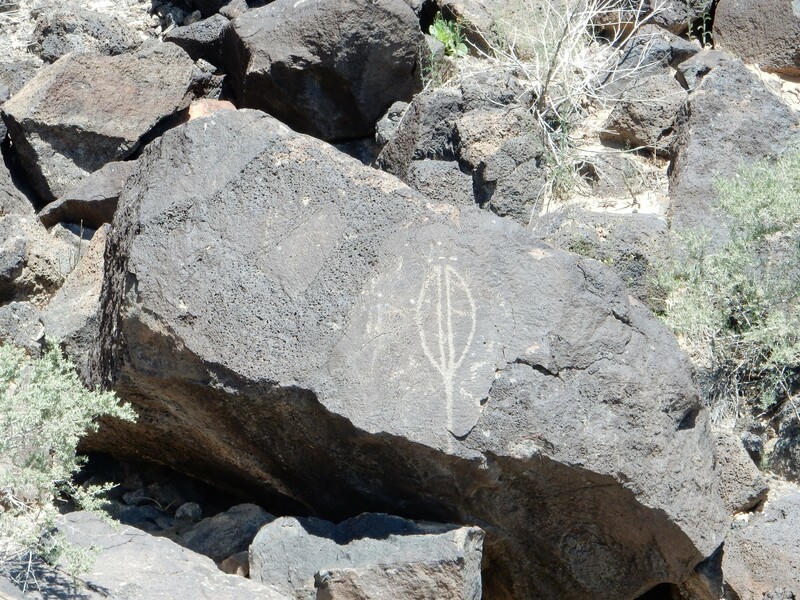 A few petroglyphs were visible from the restroom area. Clearly a bird of some kind at upper right, but lower left is a mystery. 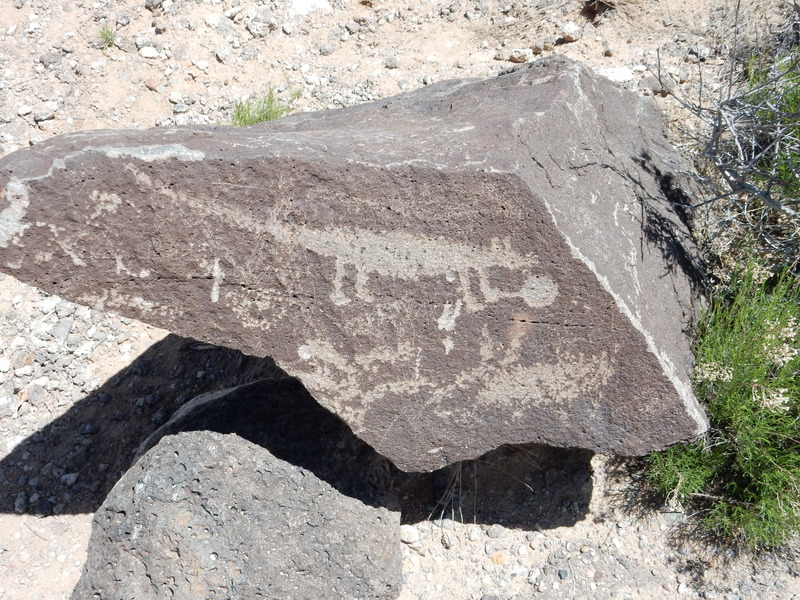 I’ll pause here to explain how the petroglyphs were created. The basalt here is an iron- and manganese-rich rock that, when fresh, has a dark gray color. (We’ll see an example later.) 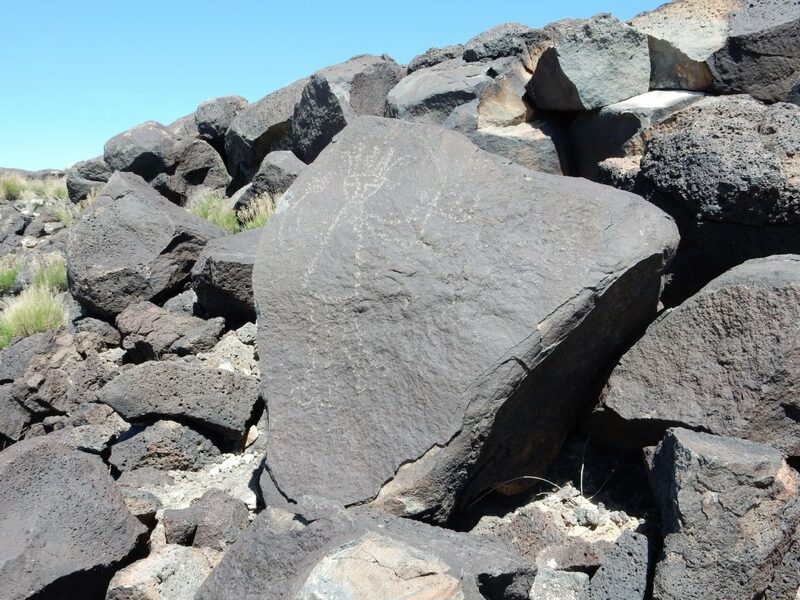 The rock blackens under exposure to the elements, over very long spans of time, as a film of black manganese oxide (desert varnish) forms on the surface. The artists responsible for the petroglyphs pounded off this dark film with fairly blunt tools to expose the gray rock underneath. 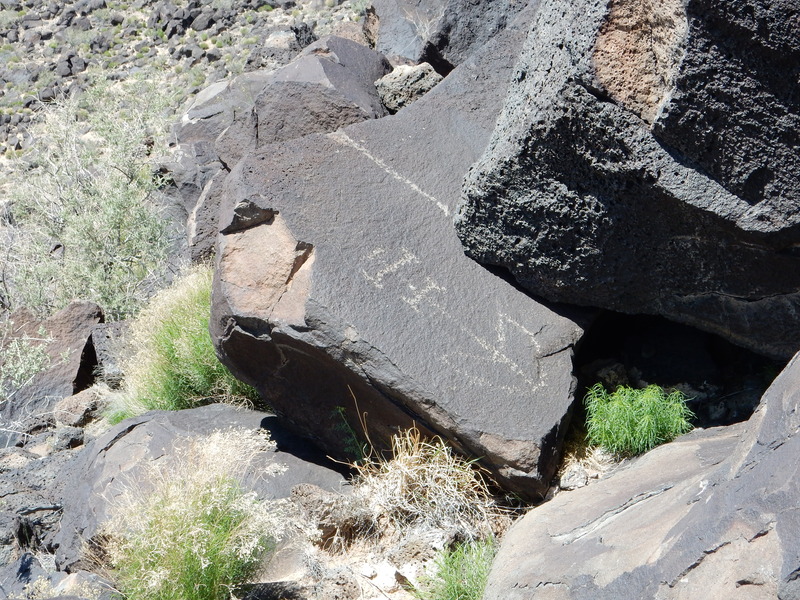 It is easy to tell authentic petroglyphs from modern vandalism; the ancient petroglyphs have yellowed under a film of renewed desert varnish. Modern vandalism lacks any desert varnish and so is unyellowed, and it tends to be created using sharper tools that leave much thinner lines. Back to my car and my backpack; yes, I had a water bottle left. I have an undemanding palate, fortunately. Chugged it all down. Then off to the main trail. My more respectful, but only slightly less wild, guess is that this represents Coyote, the trickster in some Native American mythology. Coyote could certainly be depicted as using weapons or tools. However, the body shape seems more rat-like than coyote-like. Along the way was something I hadn’t seen before — a grinding surface. This might have been used for everything from grinding grain to sharpening tools to preparing plant pigments. Here’s a cracked surface of the basalt. You can see how much lighter the fresh rock is in color. The fracture is not entirely fresh; it has already begun to yellow with desert varnish. My wild guess? The human figure is in a ceremonial stance, and the glyph to which he is connected by a line may be a sun symbol. So perhaps this depicts a shaman (priest) drawing power from the sun. This is clearly a ceremonial dancer, but of different vintage. The drawing seems less crude, but there is enough yellowing to indicate this is probably ancient. Here there is another ancient structure: A rock ring. Why, yes, I know a sheep from a horse. The sheep are at upper right. 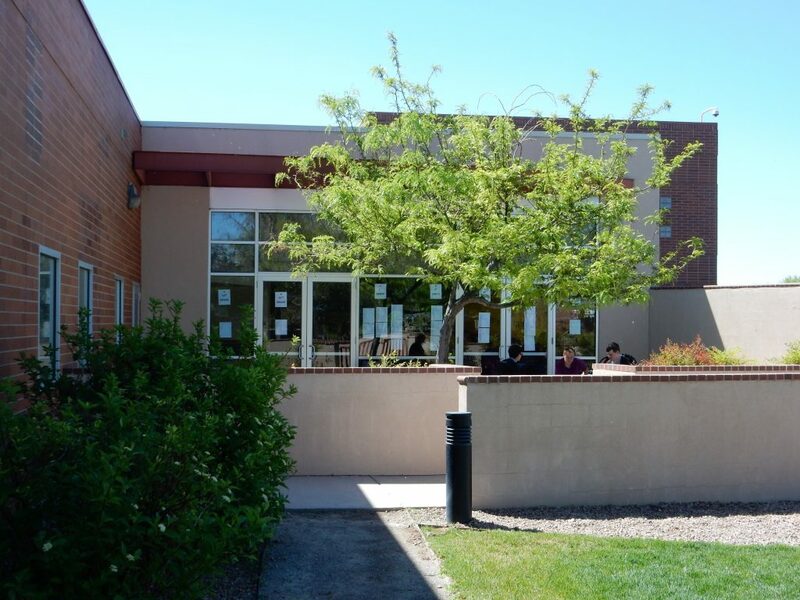 Albuquerque qualifies as a major metropolitan area, and yet it is still surprisingly rural around the fringes. There is significantly less yellowing, but this is nevertheless old. It’s a Latin cross from the Spanish era. I checked in with Nathan, who estimated he had at least two hours to go. 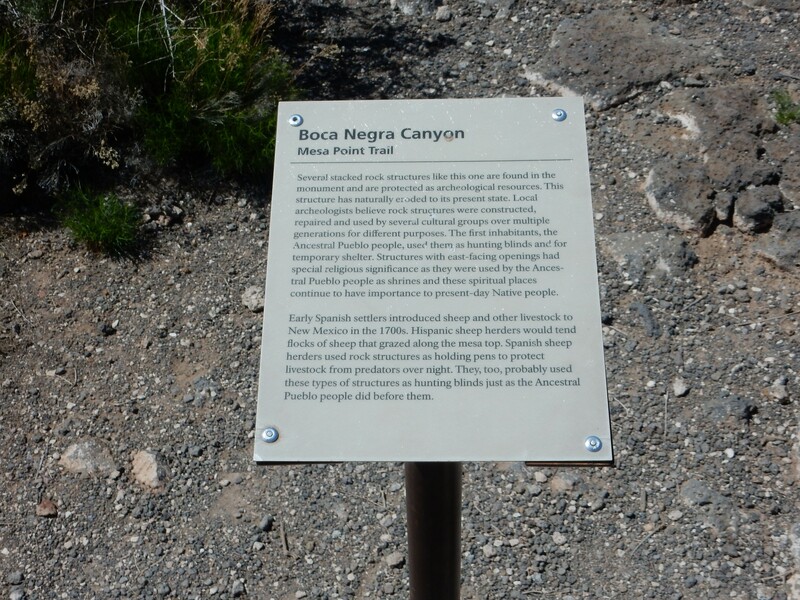 I headed up to Placitas, where I had done a quick reconnaissance earlier this spring (marred by bad camera settings). My first stop was for a panorama of northern Sandia Crest. I took more than one; this one seemed to come out best. 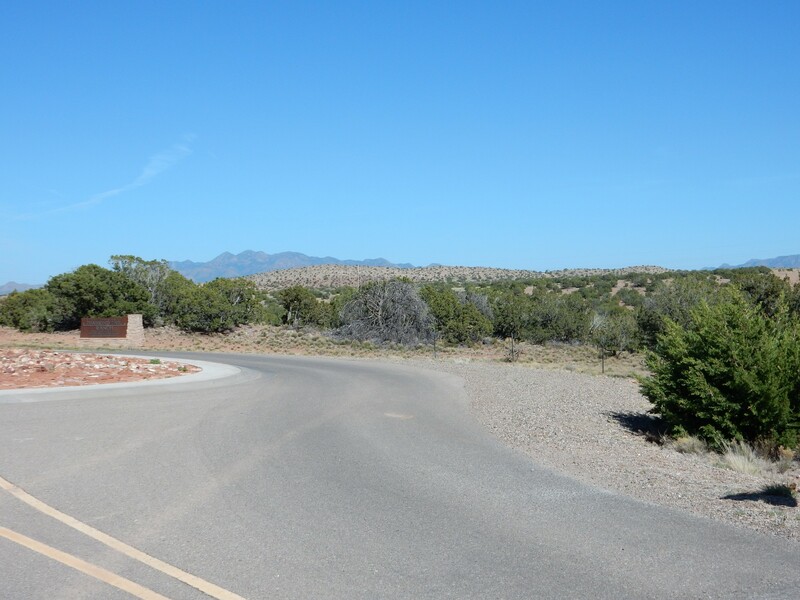 The very flat ground to the right, extending from the foot of Sandia Crest, is the Llano de Sandia, a nearly perfect example of a pediment. 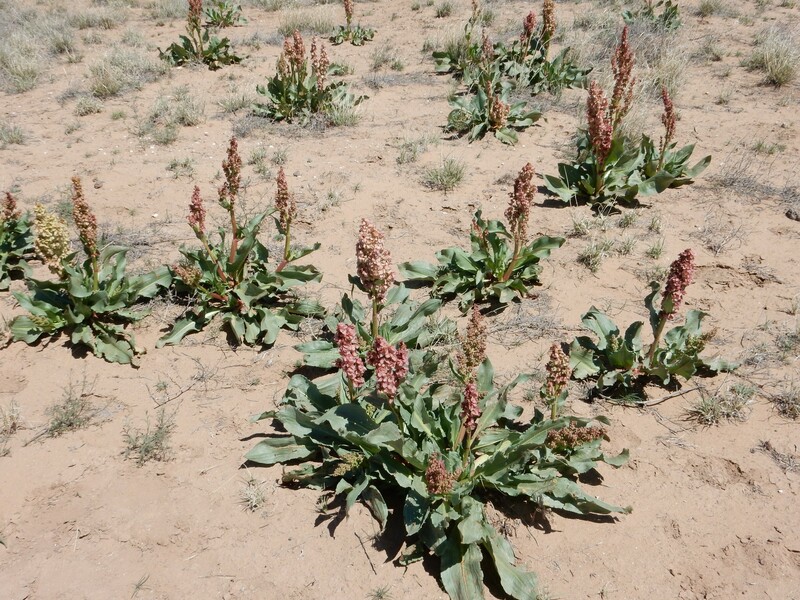 These form at the feet of mountain ranges in arid climates. The surface itself is known as the Del Agua geomorphic surface. Sandia Crest itself is mostly underlain by Precambrian granite (the Sandia Granite) and metamorphic rocks. 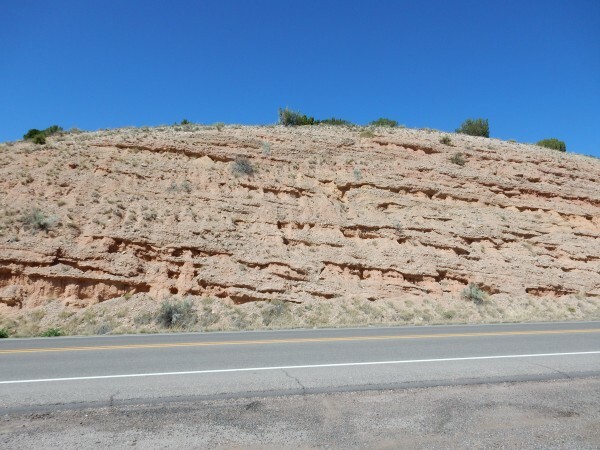 The beds at the top of the crest are Pennsylvanian Madera Group limestone beds lying on top of a thin layer of Sandia Formation beds. The road passes through a very impressive road cut, which I photographed the first time I was here — but I borked the photograph. This time I got it right. These are geologically young beds, around 3 million years old, formed from material eroded off Sandia Crest. Note that the beds are tilted to the right (east), though they were probably level when laid down. There’s a lot of continuing tectonic deformation in this area, where the Rio Grande Rift continues to tilt to the east. It didn’t look like I was going to come out of the canyon anytime soon, and time was limited. I turned around. I tried going down a couple of the dirt roads going east off the main highway in the Las Huertas graben, to see if I could get a better look at Montezuma Crest. No luck. All seemed to end in areas posted as private land, no trespassing. 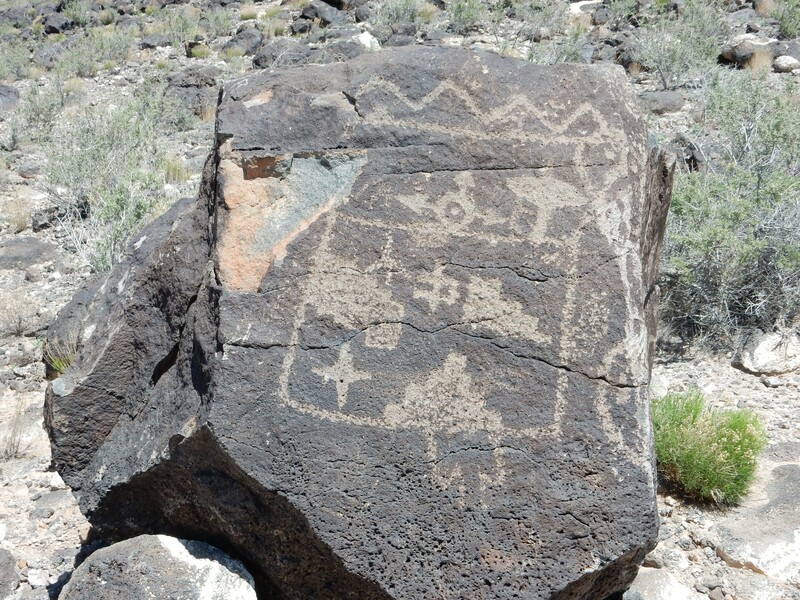 The crest itself is BLM land, but there’s no easy way to get to it without crossing private land. I took the road to the old Diamond Tail Ranch, to see what I might see up that way. This afforded a very nice view of the northern part of Montezuma Crest. The crest, and most of the slopes, are underlain by massive limestone beds of the Madera Group. These were laid down in a shallow sea some 300 million years ago. Beneath are much thinner beds of the Sandia Formation and the Mississippian Arroyo Penasco Group, the latter some 330 million years old. 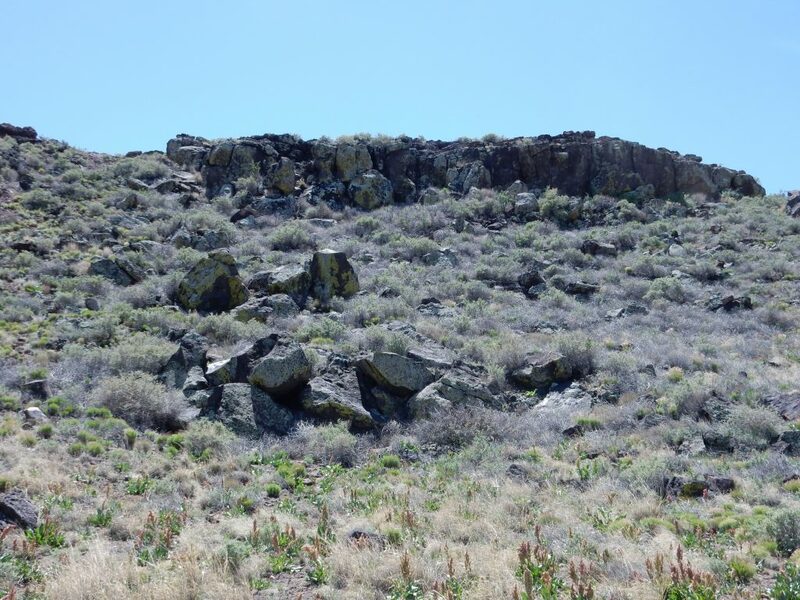 These are the oldest fossil-bearing rocks in the northern half of New Mexico. At this distance, I can’t make out exactly where these thinner formations begin and end, but the geologic map puts the top of the Sandia Formation at the lowest massive limestone bed, and describes the Sandia Formation as being about twice as thick as the Arroyo Penasco Group. 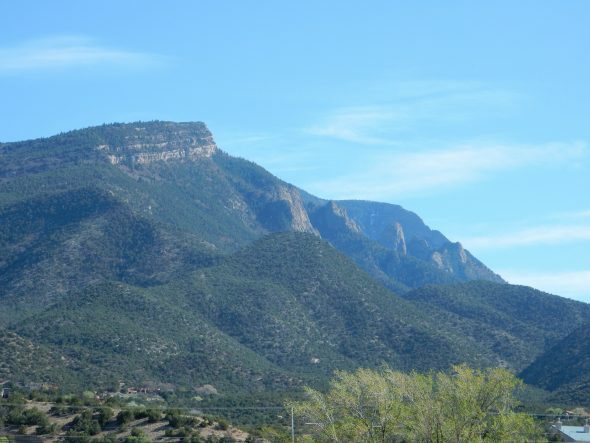 That would place the top of the Sandia Formation about halfway down the crest, and the top of the Arroyo Pensaco Group at the level of the much thinner beds towards the bottom of the crest. This area has been gentrified. 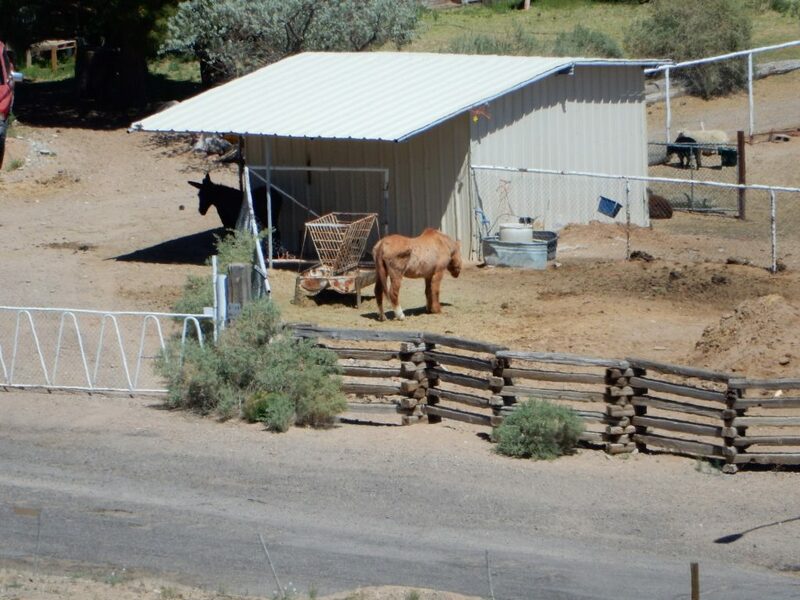 Diamond Tail Ranch is now a we-don’t-want-yer-kind-here gated community. 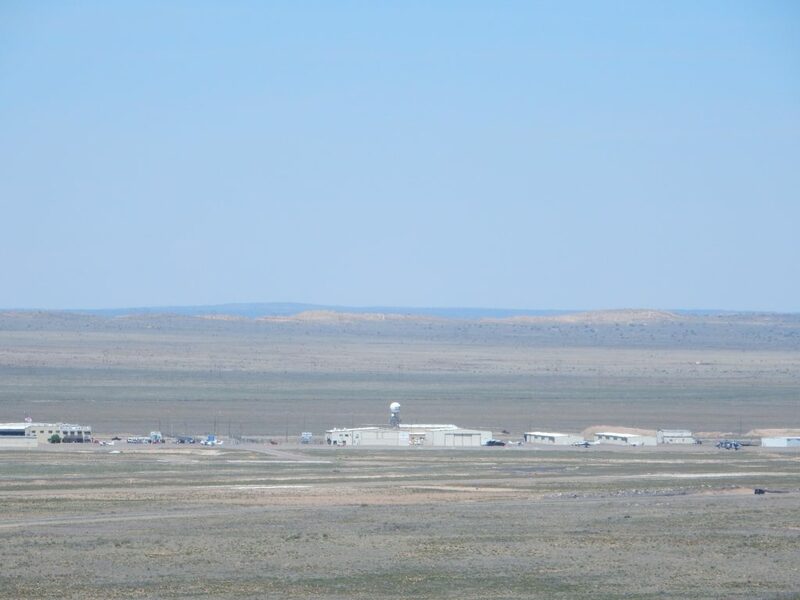 If I’m reading the map right, the hills in the middle distance are Triassic Chinle Formation sandstones, with the Ortiz Mountains on the distant skyline. The fault brings Abo Formation mudstones at right into contact with the Madera Group limestones at left. Nathan hadn’t called yet. I took the other fork of the road, and it, too, ended at a private gate. But not before I reached a spot where there was a nice view to the northeast. The foreground red beds are Permian Abo Formation. Beyond, this transitions to orange Yeso Group and then to lighter Glorietta Formation. At this point, someone in a fancy truck pulled around me slowly and gave me a ferocious scowl. I seem to get that a lot in gentrified areas. By contrast, my experience in the Jemez is that the folks I meet are almost invariably well-mannered and helpful. So perhaps I should be glad I don’t live in a gated community; it seems to make you grumpy. Did some exploring in Placitas, and got a nice view of a dike north of town. 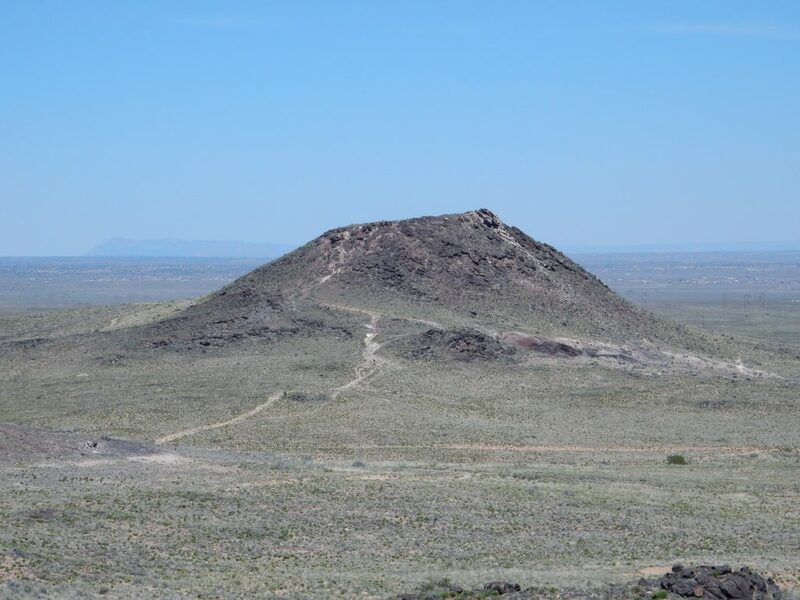 This has an argon-argon age of about 30.9 million years, making it contemporary with the Ortiz Mountains to the east. There are a lot of dikes in north-central New Mexico of this age, all radiating from the Ortiz Mountains and Cerillos Hills. 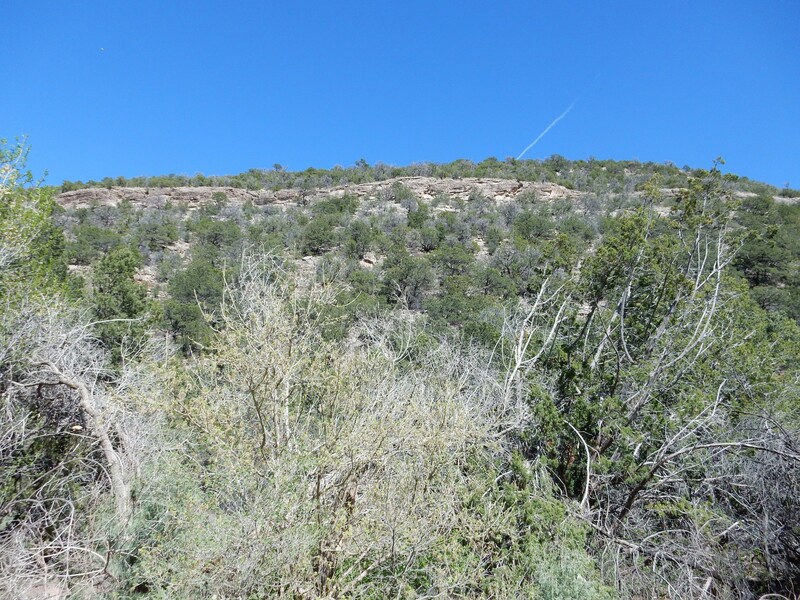 I wanted to try to find a nice viewpoint on some hills northwest of Placitas, but got on the wrong road. On the other hand, this gave me my Ansel Adams moment for the day. The spires are all weathered in the Sandia Granite. Granite is funny that way; it’s a hard rock, but it isn’t really durable. Most granite bodies have a lot of frozen-in strain, and the coarse crystals of different minerals that make up granite have different thermal expansion coefficients, so granite exposures tend to exfoliate as vigorously as an aging Hollywood actress. 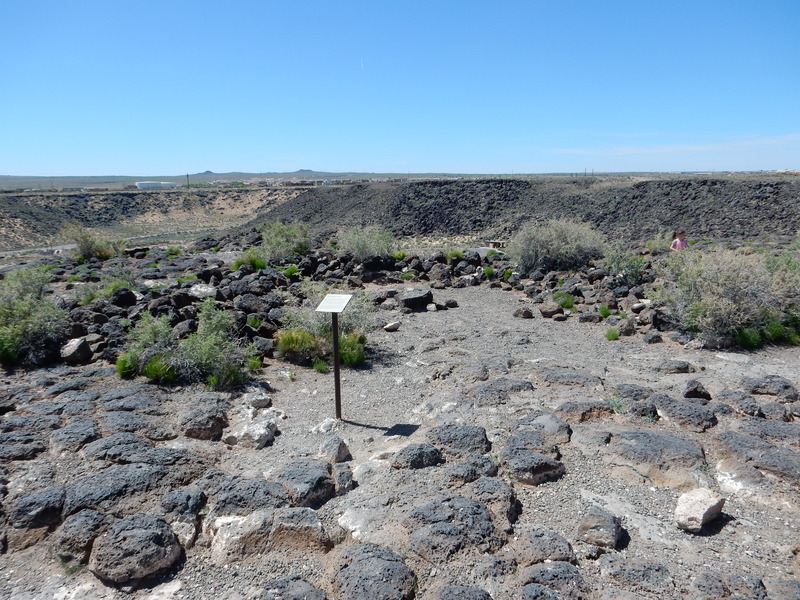 I found the right road up to a Del Agua terrace ( part of the pediment surface from earlier) for a panorama to the north. 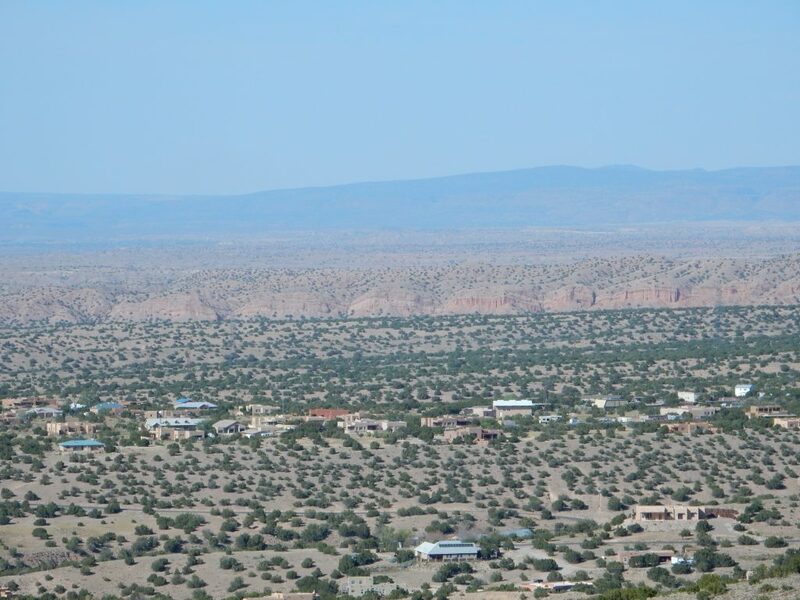 This panorama reaches from El Cabezon, on the skyline at far left, across Santa Ana Mesa and the southern Jemez, to the Ortiz Mountains on the skyline at right. The only problem is that there is an unusual amount of haze in the air — probably made up mostly of pollen. More on that later. The mesa is composed of numerous basalt lava flows, all about 2.5 million years old (contemporaneous with the Cerros del Rio). The lava erupted along north-trending faults, some of which are still active. The flows are visibly tilted to the east due to continuing tectonic activity in the Santa Domingo Basin of the Rio Grande Rift. I got a telephoto shot of the bluffs to the northwest. So far as I can tell from the map at this distance, this is the footwall of the Escala fault. 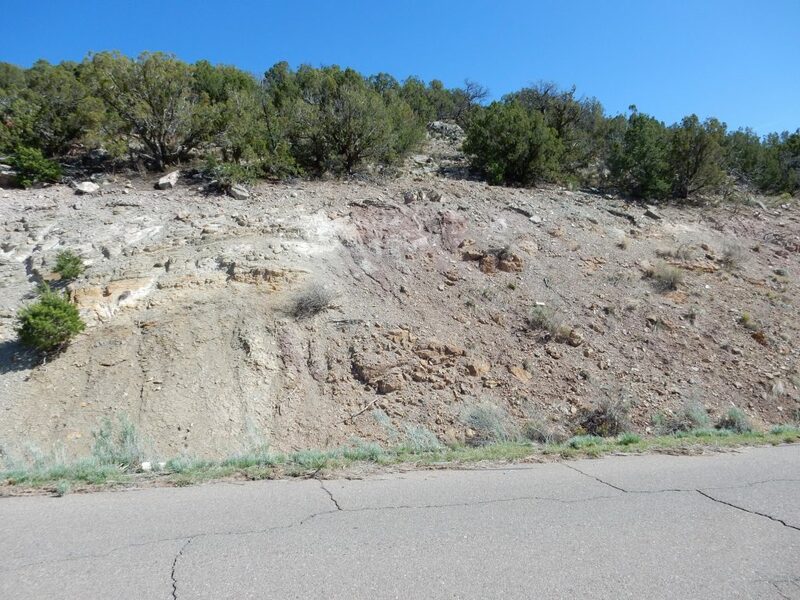 The beds are Santa Fe Group rift fill sediments. At about this point, Nathan called to tell me he was finished. I headed back to Albuquerque, picked him up, took him to dinner at Golden Corral, and we headed home. 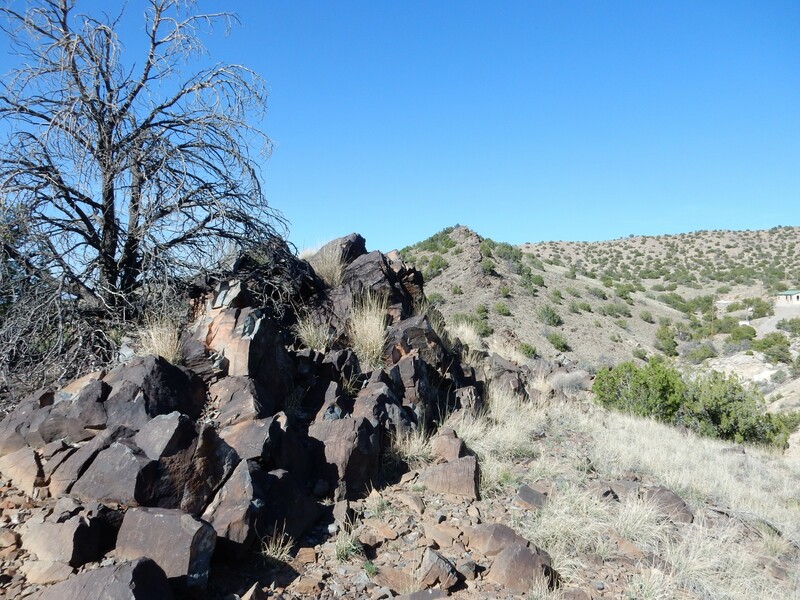 I paused along the way to redo a panorama of Espinaso Ridge that I borked on an earlier attempt. Espinaso Ridge is the dark ridge on the near skyline. 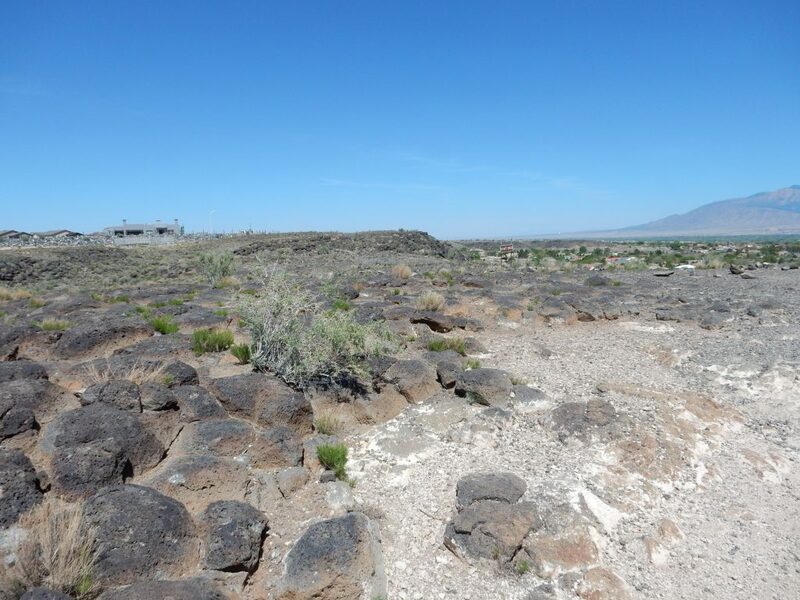 It is underlain by Espinaso Formation, which is lithified volcanic debris from volcanoes that rose above the Ortiz Mountains on the far skyline at right. 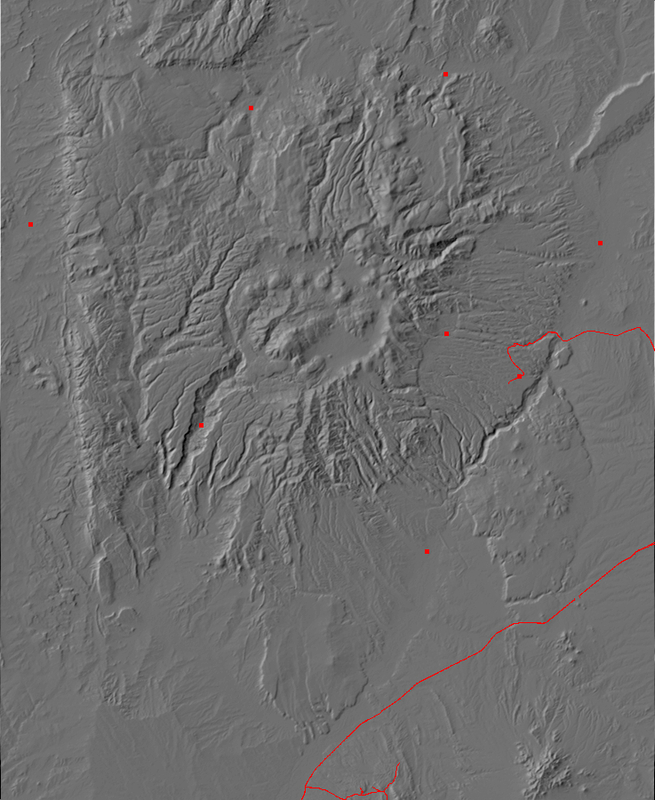 The volcanoes have mostly eroded away, but some beds of Espinaso Formation remain. 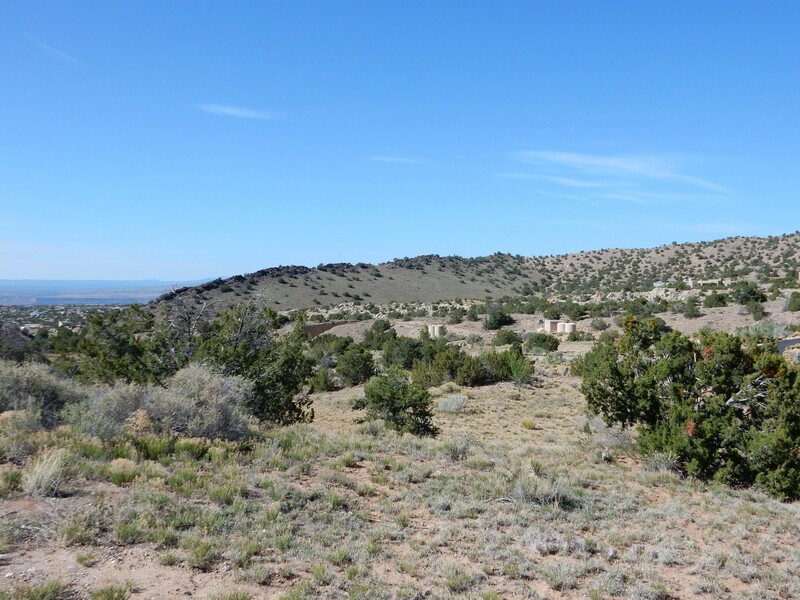 At the base of Espinaso Ridge you can see lighter beds of Galisteo Formation, which goes back to the Eocene, 40 million years ago or so. 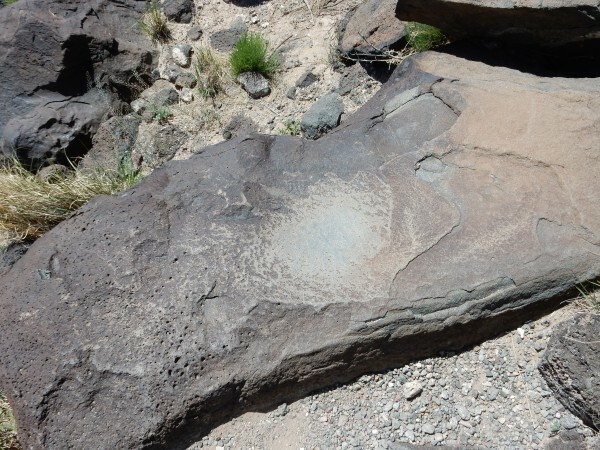 I pointed out some Cretaceous beds at La Bajada to Nathan as we passed, and wondered aloud why the sequel to Jurassic Park was not named Cretaceous Park. This prompted Nathan to some enthusiastic snarking about how most of the cool dinosaurs in the movie were actually Cretaceous dinosaurs and how the velociraptors looked more like Deinonychus. Nathan’s good company; I wish he was in better health. Got home. By then my nose was watering ferociously. However, the aching and tiredness had not returned; I figured this was allergies, what with all the pollen in the air, and with my recent cold leaving my immune system on high alert. It seems unfair that a hefty cold also turns up the hay fever and cranks up the blood glucose level (something I’m sensitive to as a diabetic), but there it is. It was not enough to keep me from singing with my church choir today, though I was not necessarily singing my best. 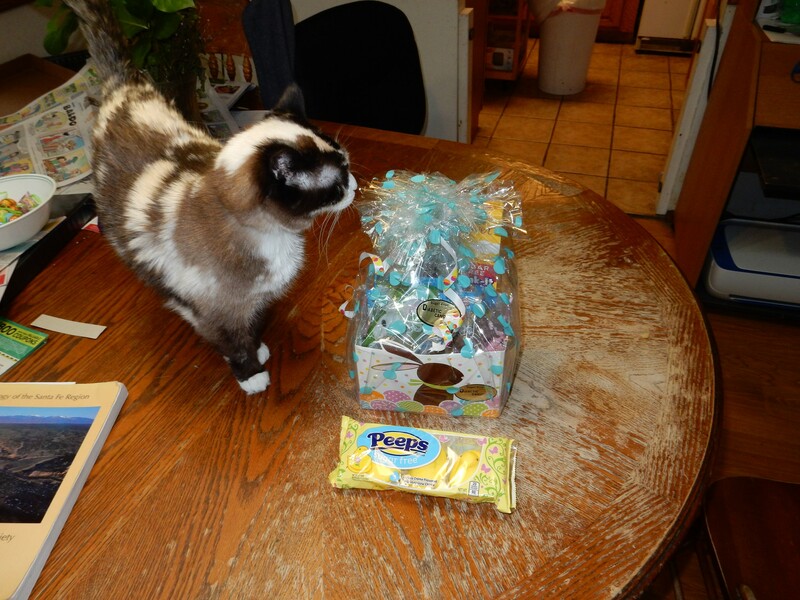 Easter Kitty? That’s actually one of my milder heresies. She hates to be left out of photographs. Her proper name is Stormy, but I call her Bear and my daughter calls her Stupid. Because she is. I think; sometimes I think she’s putting us on. Anyway, she’s the only one of the five cats who doesn’t like catnip, who comes when you call her, and who doesn’t land on her feet when she falls. (She usually lands on her head.) I think she thinks she’s a dog. I didn’t know they made diabetic Easter baskets or diabetic peeps, but apparently my wife knew. This is way cool, even though I regard Peeps as more of holiday decorations than as edibles. 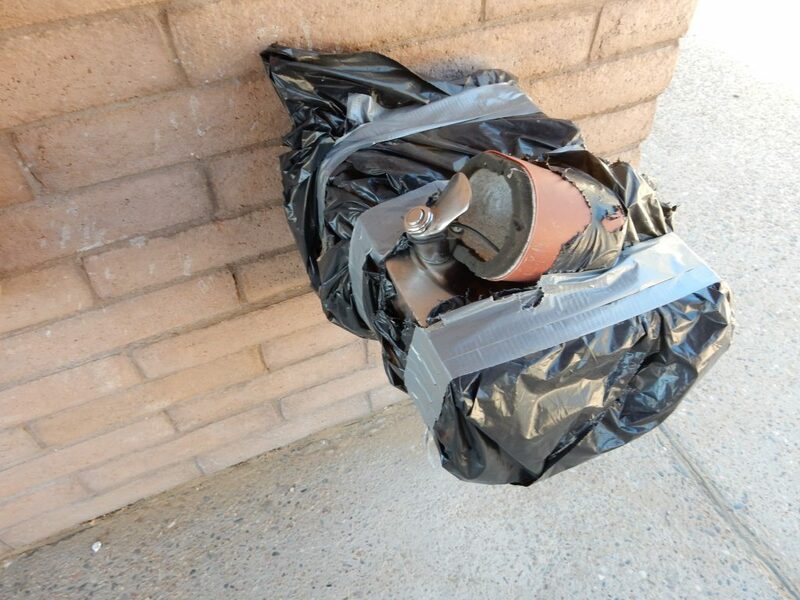 Kind of like fruitcake, but not so easily weaponized. Back to work tomorrow, assuming I’m right about the new runny nose being allergies and assuming the place didn’t burn down while I was away.